2009 is the International Year of Natural Fibres. Click the IYNF logo for more info, or follow the link below to read more about spinning a range of natural fibres. See all entries on this topic. Better late than never right?! I posted very infrequently in 2010, but I did get a fair bit of knitting done. At least half of it in the later part of the year, after I got to the point where my back wasn’t bothering me any more. I can knit as much as I like now, as long as I’m sitting comfortably, and it’s made a HUGE difference to my motivation - as you can imagine. I’m working on achieving that same goal with spinning - at the moment I’m limited to sessions of about 30-45 mins at a time, although I can manage a few of those in the same day if I do some stretches in between. Laila’s Socks by Nancy Bush, which I’ve had the yarn for forever and have always wanted to knit. I cast them on Christmas Day and finished the first one on Boxing day - this pattern is dead simple! Pink no-purl Monkeys in Tosh Sock, LOVE knitting with this yarn and it’s wearing well. 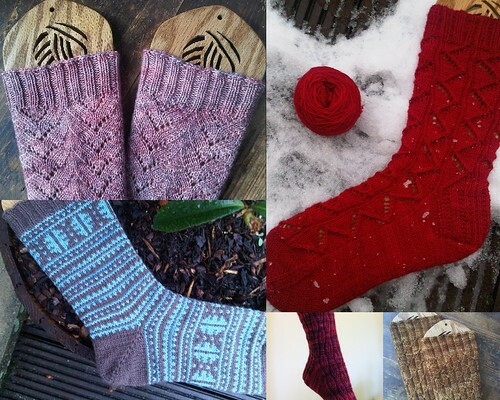 The red socks are made from yarn by a great friend, Pippa, and designed by another great friend, Ruth from Rock & Purl. There’s a second pair of Hopscotch socks, in Plucky Knitter yarn. I LOVED these socks and discovered holes in them just the other night :-( Not any fault with the yarn, I wore them (literally) to death, at least twice a week for nearly a year. Lastly, bright pink Koigu Amelie socks which were Ruth’s birthday present. The tiny shoes (Tosh Sock leftovers) were for a friend’s baby, but the rest was sent to Australia for my new nephew Liam, born in October. I knitted the blanket from Rowan Wool/Cotton and I thoroughly recommend it. It’s nicely washable, great stitch definition and easy on the hands (I couldn’t do pure cotton). And of course, the obligatory Baby Surprise Jacket, and Elijah. Yes, there was weaving - A scarf for Neil for Christmas from Devon Fine Fibres Cashmere (which I am in love with) and my charkha-spun cotton table runner. I had a bit of a run on mittens, only the Endpapers (koigu again) were for me, the other two were Christmas presents. My first Haruni was also gifted, but I plan to make another one, most likely also in Malabrigo sock as this one turned out so great. The little star was a present, the red bobble hat one of a string of bobble hats that seems to be never-ending. 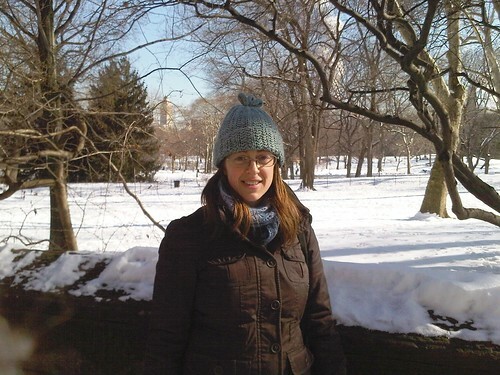 And my Snow Day Hat, handspun from Oceanwind Knits fibre, was actually the first thing I finished last year, but got the most use last month while I was in New York. It’s extremely warm! There were two things that didn’t make it into this post, as I don’t have photos. One was a handtowel I made for Stephanie as a housewarming present, and the other was the first bobble hat - knitted for me, worn a million times, and still un-photographed! So, bring on the 2011 knitting time now! 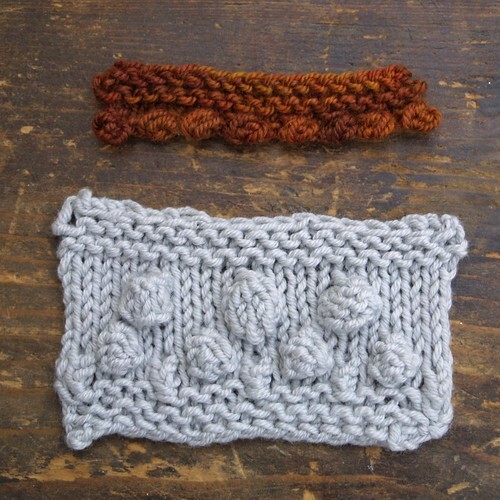 I took two classes with Merike Saarniit at Vogue - one on Nupps, Buds and Bobbles, and one on Elongated Stitches. 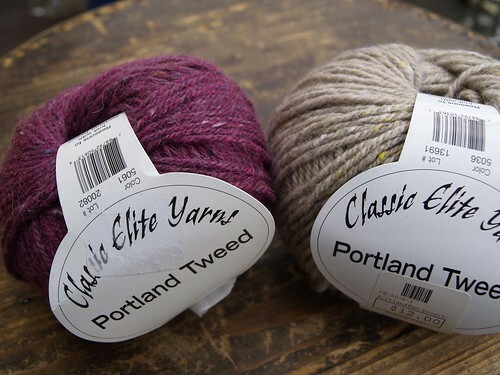 I’d heard good things about Merike after Knit Nation and I was really looking forward to these two. 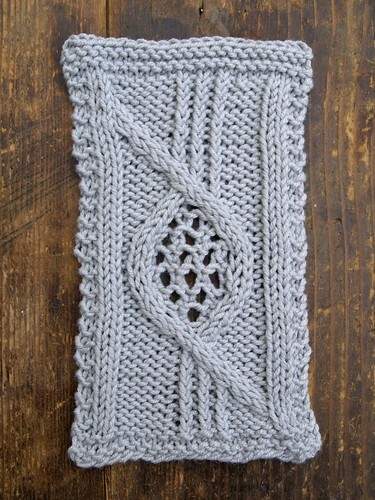 I’ve done classes in the past with Nancy Bush, and have all the ‘Estonian’ books, but it was great to get an angle on Estonian knitting from a completely different direction. Merike is totally sweet too, and her classes were really fun, as well as being loaded with very useable techniques. It’s like smocking, but a sneaky technique that doesn’t require a cable needle. and I think it sits better too. 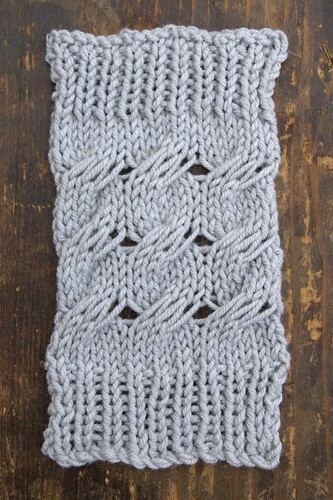 I can see myself using this stitch loads, I already have a design in my head (and conveniently, cashmere in stash). 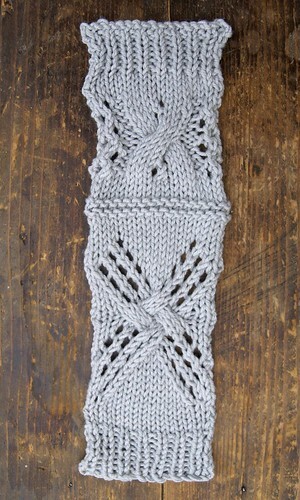 This swatch has the wraps worked on a 1×1 rib, but it looks just as effective on stocking stitch or other backgrounds. The needle I was using was a bit big, so it’s untidy, and also needs a bit more practice. The other swatch is a bunch of bobbles in various stitches. I have another swatch that I’m not bothering to show, it’s just a series of different nupps. I did them all, and picked my favourite, and you don’t need to see how messy my swatch is! In the elongated stitches class, we knitted stitch after stitch and, just like in the bobbles class, the first one was my favourite again. (Maybe Merike always does the best stitches first). It’s at the bottom of the swatch on the right. I didn’t like the 2-colour stitches at all, but that could have been the yarn I was using (not very suitable) and I can see the potential to explore further. The stitch at the bottom of the left hand swatch I also love. 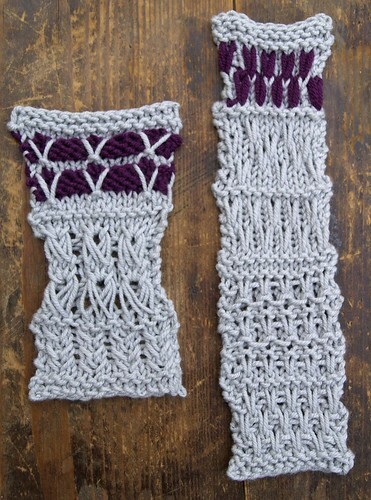 It would look great in a variegated yarn, but even here you can see how the little v’s kind of ‘hug’ the columns. It makes great ribbing with some purl sts in between. 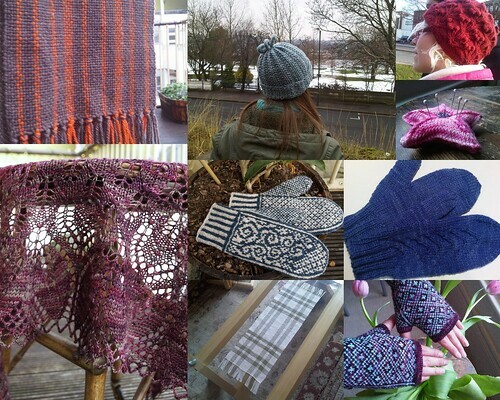 That was it, Merike is going to be at Knit Nation again this year and I thoroughly recommend you sign up for something with her if you didn’t get a chance to last year! 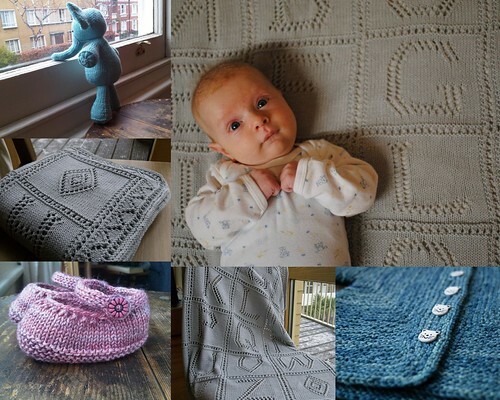 I took four classes at Vogue Knitting Live, one with Melissa Leapman on Cables, Cookie A’s Stitch Pattern Design class, and two with Merike Saarniit. VKL ran Friday to Sunday, and Ruth had classes all day each day. I didn’t start till Friday afternoon, but we had breakfast together and I wandered over to the Hilton with her, registered, and then hung around knitting and knitter-watching. By lunchtime I’d already spotted a February Lady Sweater, a Yarn Harlot, and someone knitting socks while waiting for coffee. Friday afternoon was my cables class. I really tossed up whether or not to go to this, if it had been Sat morning I prob would have skipped it - so as not to have such a full day - but I went, and I learned a couple of things, so it was worth it. Melissa was great, but although the class was billed intermediate it was pretty straightforward, and full of beginners that needed things explained in very small words. This is really no-one’s fault, but it meant we didn’t really do anything exciting. (I’d love to see a lot more advanced classes on offer at the next VKL). We did some funky stuff with extra-wrapped stitches and lace in the two swatches above, I really like the crossover lace/cable panel - Melissa had one as the centre of a big square and it would make a great blanket. 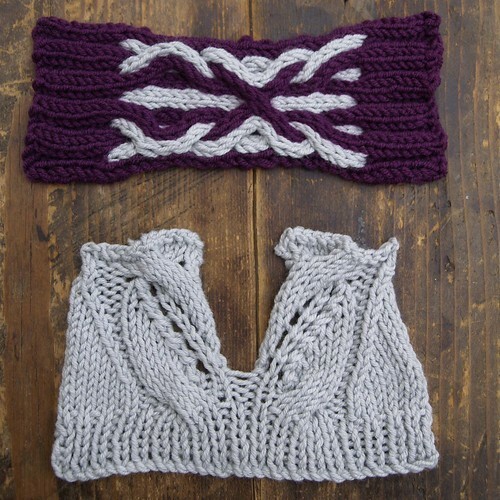 The funny shaped piece is the beginning of a v-neck; the cable pattern sits inside the fully-fashioned decreases and continues intact up the sides of the neckline. The 2 colour cables were fun, but made me realise that I would never do a project with this in! It’s an extremely bulky fabric, and eats up yarn like you wouldn’t believe. I just wasn’t really a fan. Cookie A’s class was great. If the cables were not much of a brain challenge, then Saturday morning made up for that big time! I chatted at the beginning of the class to the girl next to me (new friend - hi Patty!) but as soon as we started it was head down and hard at it for 3 hours. We started by talking about how to make lines and pictures in knitting. Cookie discussed three different techniques, using knit/purl combinations, using increase/decrease pairs to move stitches, and using cabling and crossed stitches. Then we started our design by sketching on paper, the sketch was turned into a chart (sounds easy, but this was the hard bit) and we knitted swatches. This was the swatch I ended up with. I meant to take a picture of my original sketch so you could see where it came from, I’ll try and remember to do that later. I’m still playing with the placement of the twisted columns - at the bottom they’re in the centre, but they look like they’re way off to the right. I’ve moved them across at the top, but I think they still need to move a little more. 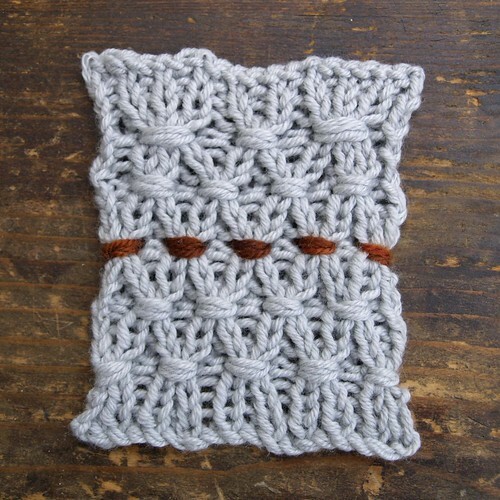 Tomorrow I’ll post about the two Estonian stitch classes I did with Merike - they were great fun! Last week I jetted off with my friend Ruth from Rock & Purl to attend Vogue Knitting Live in New York City. It was SO much fun! We took classes, we wandered Manhatten, we wore all the handknits and layers we could scrape up as the temperatures plummeted to -17 degrees. MINUS 17!!! I have never been out in such cold weather (I came close 13 years ago in Germany) and discovered that you actually have to wrap stuff around your face just to be able to breathe. Here I am by Central Park, it’s lovely and sunny, but don’t be misled by that sparkliness. I’m wearing uggs, tights, handknit socks, jeans, camisole, cashmere sweater, silk shawl, woollen shawl, gloves, mittens, puffy coat, and the snow day hat. It was still cold. 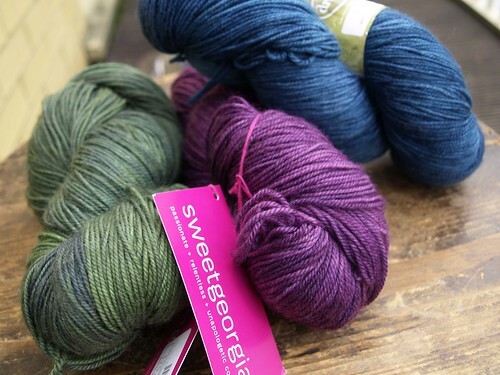 Including the amazing Dream in Colour Smooshy with Cashmere which I assume is new as I’d never heard of it (why not? why not?) And none of my friends had either, plus two skeins of Sweet Georgia Tough Love. One for me and one for Neil. 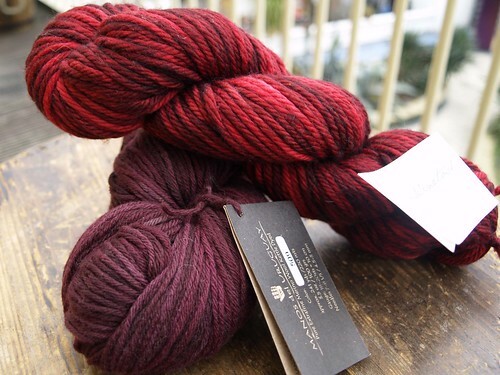 I’ve always wanted to try out this yarn, and I’m a bit in love with raspberry at the moment. I took a class with Cookie and got to see all these socks in person - there’s loads I want to knit, first up will most likely be Pointelle. There will be more posts to come with swatches and notes from the classes I took - I thought they deserved posts of their own! I haven’t been blogging much as I have had horrendous problems with spam. I need to upgrade my WP and clear out comments and generally just get things going again. In the meantime, I’ve switched off commenting which will hopefully help, I’m trying to figure out how to allow comments on new posts, but not old ones (which seem to be the ones that attract the spam most). If you are an actual reader/friend and you have any advice please email me with it! I’m posting parcels today and will be sending out the first notes tomorrow afternoon. I emailed everyone earlier this week to double-check email addresses, but haven’t heard back from everyone yet! If you didn’t hear from me, check your spam filter and make sure I’m added to your address book so your notes don’t get lost in the ether. Also let me know if you want me to use an email address that’s different from the Paypal one that I have. 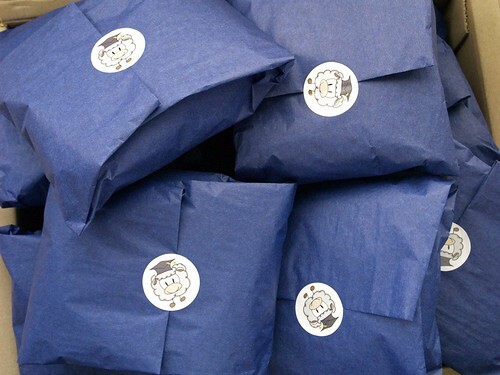 The first Fibre Club parcels are all set to go out tomorrow :-) This is going to be so much fun! There are only two spots left in the club, and I’ll be closing sign-ups later today. Details here if you’re tempted. Welcome to Spintelligence! I’ve wanted to run a fibre club for ages and now that my Pilates training is finished I have the time to devote to it properly. 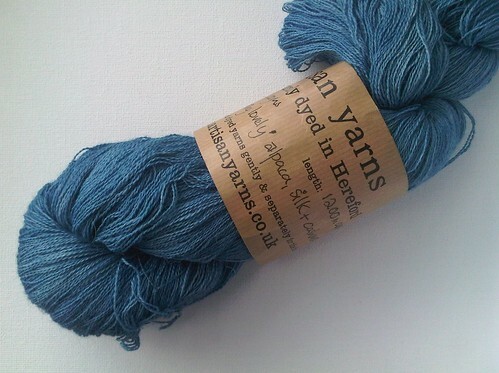 The club will run for 6 months, with three postings of gorgeous hand-dyed fibre from Indie dyers. You’ll also get spinning techniques, tips and tutorials, plus chat and advice throughout the club. You can see all the details and prices here, Sign-ups will open at 11am today Sign-ups Open!! P.S. 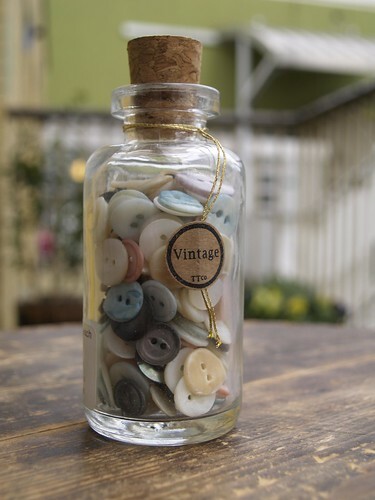 Don’t you love the logo :-) Made by the fabulous Rock&Purl! I know I’ve been in and out lately, well for the past year really, but things are settling down around here. My training is practically over and my joints are behaving enough to be able to crank up the spinning and knitting again. I’m very keen to start up a fibre club, similar to things I’ve done in the past. Plus all the social gossip and chat that goes along with a club, including hopefully a real-life meet-up for each shipment as well. I’m still considering ideas for payment models, fibre folks and delivery methods, I’d love to hear your thoughts, so please pop by the Ravelry thread and let me know what you think. It’s been so long since I was here that I just had to delete 1,300 spam comments. Urk. So, news… Well, I’ve finished the bulk of my Pilates training and am searching for a job in a studio. August is a pretty dead quiet month for Pilates though, so no-one’s in a particular hurry to be hiring. There’s some stuff around though so I’m not worried. I’ve also started training for my specialisation in Low Back Pain, pretty heavy going! It’ll take roughly the rest of the year to finish, maybe a bit longer. We’ve got some travel planned for the rest of the year: off to Prague for the August bank holiday, visiting Will and Elcin in Istanbul in October, and then Kai and Ollie in Germany in December. Neil’s talking about going somewhere warm for New Year’s, he’s never been a fan of the London winter. So you may find us in the Caribbean or something! Last weekend was Knit Nation here in London, I booked my tickets in December on the day they were released and have been so excited about it! It’s the only fibre event I’ve managed to get to this year (and do classes and so on, I did get to shop at Unravel), and it was brilliant to catch up with everybody. So many people I haven’t seen in ages and even though I was there 2 days it wasn’t nearly enough time to properly chat with everyone. I know you want to see swag, it’s very small though. I’m not knitting much these days, so the stash is going up rather than down at a rather alarming rate, so I’m being careful not to over-run the flat! 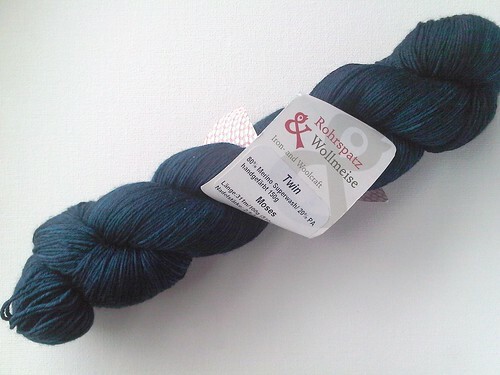 I bought only two (2) skeins of Wollmeise (I know, crazy right?) in Taube and Moses. I have never knitted with it, and already have one skein in my stash, so until I’ve tried it, I don’t really think I should go nuts over it. It’s one thing to love the colour, but if I don’t like knitting it, where would I be then? (What? You’ll willingly take it off my hands? Surprise surprise.) 3 skeins is plenty for now. 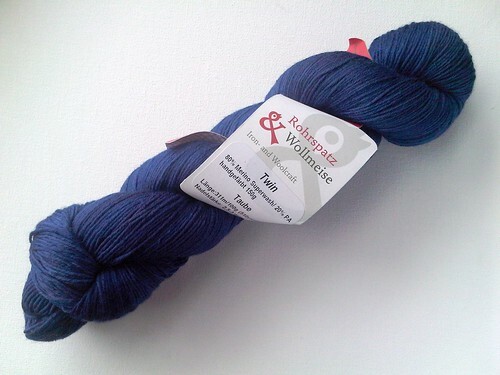 I also bought baby yarn for the niece-phew in roughly the same colour, I figure there’s a good chance the baby will have eyes this colour too, so it’s an obvious choice. 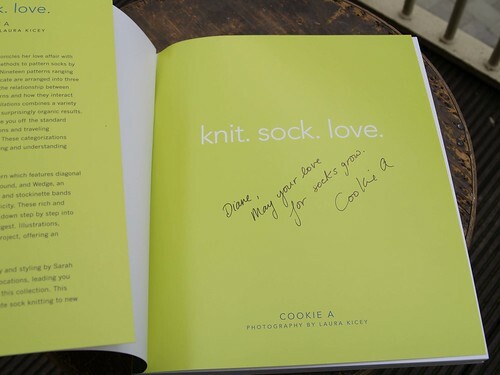 Cookie A was there, so it was a good time to pick up a copy of Sock Innovation, which I’ve meaning to do for a while, and get it signed! 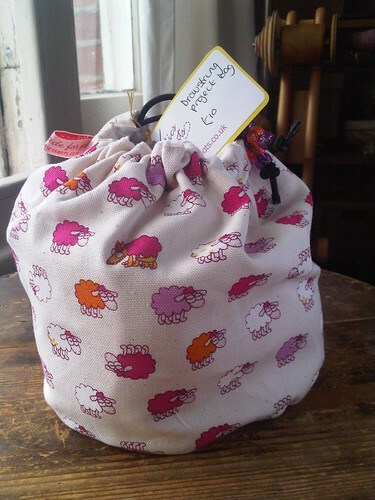 And last but not least, a sock project bag from NicsKnots - see the wolf? I love this fabric. Next knit night may see me combining the book, yarn and project bag into one big happy KN-purchases-project. I have my eye on Sam at the moment, or maybe Bex.